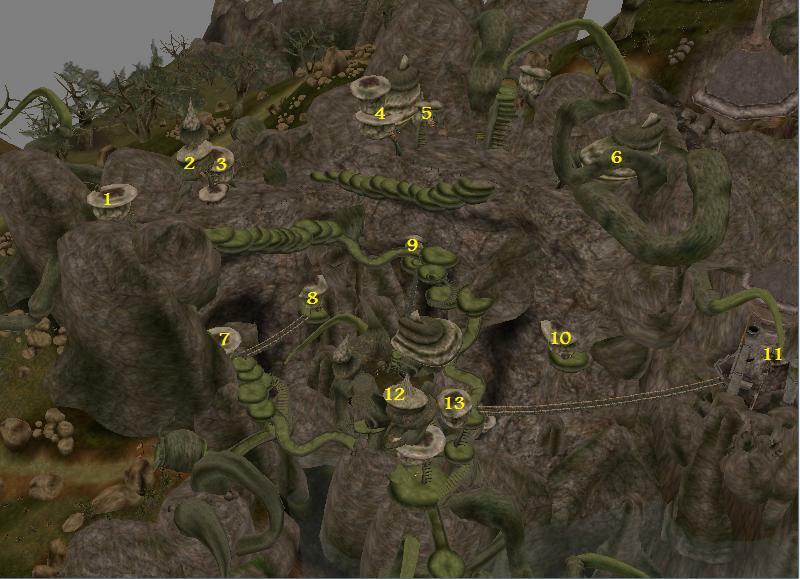 Marog is a small Telvanni town built into the cliff face opposite the Imperial city of Helnim. It consists mainly of a number of housepods joined together by a series of paths and bridges which cross a large drop to the sea below. Its main claim to fame is its proximity to the Dwemer ruin Kemel-Ze, which brings countless adventurers and archaeologists through the town. The town's population reflects this, as most are used to the countless stream of tourists, and regard the player with little added interest. 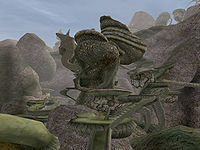 The town is ruled by the Telvanni wizard Rilmas Athyrion who oversees his domain from the tower of Tel Onoria. The only way to get to Marog via transport is to take a ship from Helnim, or take the short walk around the bay. A ship in Marog will take you back to Helnim, or this can be achieved through use of Divine Intervention. Almsivi Intervention, when cast in Marog, will return you to the Vvardenfell city of Molag Mar. The ruler of Marog is Rilmas Athyrion, who is pleased with his ownership despite the town's small size. He inherited the position from his father, Isaril Athyrion, and has taken it on with pride, seeing it as his duty to rule and protect his people. He lives with his wife, Solas Athyrion, in the tower of Tel Onoria. Solas is an honest Telvanni Spellwright but has a particular dislike for Imperials, describing one in particular as a 'pompous braggart'. Rilmas Athyrion is helped by Girevos Irena, head and soul member of the Marog Registry found at the bottom of Tel Onoria. He deals with the town's paperwork, and details all the happenings in Marog. Tilveran Athere is the captain of the guard in Marog, a straightforward Dunmer who willingly engages in her duty to keep Marog safe. She regards the adventurers passing through to Kemel-Ze with disdain, calling them a lot of 'ill-mannered looters'. 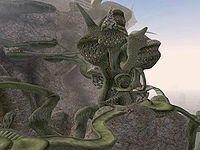 Marog is dominated by the tower of Tel Onoria, although it is unusual among Telvanni towers because it is separated into different parts not linked together. Instead one must travel around Marog to reach the upper levels of the tower. As far as the government of the city goes the only other place of note is the barracks at the top of the cliff where you can meet Tilveran Athere, captain of the guard. The Market, opposite the Barracks across the cliff, offers a few other services, although little of interest to an adventurer. The only other shop in town is run by Tarvel Drenith, who sells a small selection of weapons and potions among other clutter, but he will buy almost anything off the player with his limited gold, or the player can stay in the small tavern near the Market called The Swallow's Nest. Probably the only place of interest to an adventurer are the ruins of Kemel-Ze, accessible by a bridge that dominates the eastern side of town, but reached more easily by exiting the town to the north and following the path back down to the cliff.